Today I’m making lemon bars, and they shall be very lemony indeed. 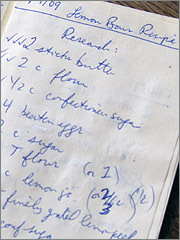 I am what you might call a recipe “aggregator”â€”when I decide to try a new recipe, I look at a half dozen or more recipes online at favorite sites like All Recipes and the Food Network, and then mix them together on the general principle of putting in the largest amount of each ingredient given across all the recipesâ€”especially the ingredients that are butter. You are currently browsing the Square Zero archives for December, 2009.